Replacing Bathroom Tile – What can I do about a missing bathroom tile? Replacing bathroom tile just because the grout needs repair, it’s a dated color or you have a single tile missing is expensive. You can save up to 75% of replacement costs by having your bathroom tile refinished by Miracle Method. 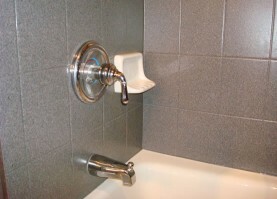 Bathroom tile around the bathtub, on the walls or on the vanity are all excellent candidates for tile refinishing. Miracle Method’s process of cleaning the tile, use of our MM-4 bonding agent, and application of superior top coats will assure you a durable long-lasting finish for your bathroom tile. 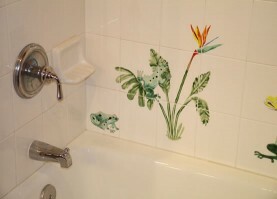 This homeowner was given an estimate of $5,000 to replace hand painted tiles in two bathrooms. Miracle Method saved them over $4,000! Replacing bathroom tile can be a very difficult process. Determine what is behind the tile. If the tile is set in plaster or lightweight concrete, it will be much more difficult to remove than if the tile is glued or set onto green board or drywall. Once all the tile is chiseled off the wall, the backer board should be replaced. This is a messy, dirty process. Be sure to protect the bathtub from any falling tile or tools. Replacing the tile will take patience and a good tile saw to make sure the new tile goes in straight and flush. Be prepared to have the bathtub out of service for several days. Before you start ripping down tile, be sure to get a free estimate from your local Miracle Method refinisher. Click on Find a Location or call our toll free locator number, 1-888-271-7690, to talk to a Miracle Method professional about refinishing bathroom tile.